Are there children or pets that live in or visit your home? Both children and pets can be curious, and this means they get into things they shouldn’t. In fact, thousands of children under age 6 are victims of accidental poisoning every single year. From chemical cleaners to your medicine cabinet, it’s important to poison-proof your home. You can do this in a few easy steps. Next, lock the doors and cabinets where you store these things. You’ll also want to secure cupboards that are high up with a lock or child-proof latch. That’s because poison experts have said children and even pets have been known to climb for what they want. From pulling out drawers and using them as a step ladder to grabbing a chair from the next room, you can count on children being crafty. So don’t make anything easy. You’ll also want to move personal items like purses, baby bags, and the like out of reach. Third, you want to get rid of all expired products and medications. Your household cleaning products don’t always have an expiration date, but that doesn’t mean they don’t expire. 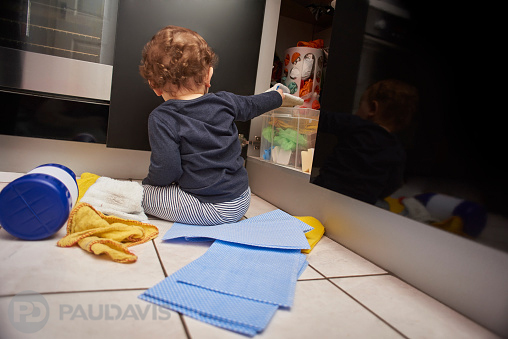 Here’s a great article on the expected shelf life of common household cleaners. Additionally, never keep expired medicines in your cabinet. But don’t get rid of them by tossing them in the trash or dumping them down your toilet or sink. Instead, take them to your local pharmacy. They’ll help you dispose of these medications properly. Finally, be sure to keep an eye on your children and pets. The best way to prevent accidental poisoning is by watching your loved ones. Because at the end of the day, there’s no childproof container, lid or lock that will keep a pet or child at bay forever. Eventually, they will find a way through—so it’s important to be aware of children and pets at all times. No one wants to think about a child or pet getting into something they shouldn’t. But when you’re aware that this can happen and take steps to poison-proof your home, you’re already two steps ahead. So take the time now to look around your home and identify potential problems. It could save a life.